Palo Alto-based home equity fintech startup Point on Wednesday announced the completion of a $122 million funding round, $22 million of which came from Series B funding led by Prudential Financial and DAG Ventures and five other investors, including longtime backers Andreessen Horowitz, Ribbit Capital and Bloomberg Beta. The additional $100 million is a capital commitment from Kingsbridge Wealth Management, all of which will go toward homeowner investments. “With these new partners bolstering our ability to serve homeowners, Point is better equipped than ever to realize its vision of a compelling alternative to debt-based consumer finance,” Point co-founder Eoin Matthews wrote in a blog post on the company’s site. Founded in 2015, Point is an alternative to traditional home equity lines of credit (HELOCs) where homeowners are able to secure a loan up to 85 percent of their primary home’s appraised value minus the remaining balance on the first mortgage. Homeowners then satisfy the loan, plus interest, through monthly payments. 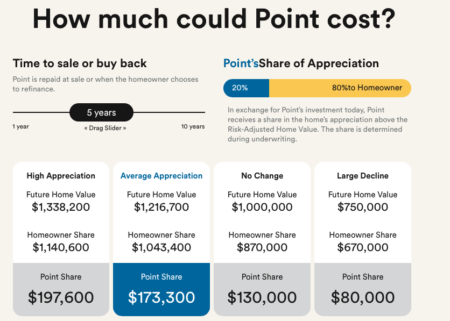 Instead of issuing a line of credit using the home as collateral, Point pays homeowners for a share of their home’s future appreciation up to a sum of $250,000, depending on the home’s value and equity. To participate, homeowners must own 20 to 30 percent equity in their home, be creditworthy, ensure a solid debt-to-income ratio, and must be in a neighborhood that has appreciation potential. After completing a pre-approval questionnaire, homeowners will continue with the application process, which requires them to upload financial and mortgage documents. From there, Point will send an independent, third-party appraiser to the home and a final offer will be made based on a risk-adjusted home value of 20 percent that offsets small, home value declines. Lastly, homeowners will receive a lump sum, minus a 3-5 percent transaction fee, an appraisal fee and an escrow fee. Homeowners will then have 10 years to buy back Point’s share or sell their home. If they sell their home, Point will receive 20 percent of the appreciation. Point currently operates in California, Colorado, Florida, Georgia, Illinois, Maryland, Massachusetts, New Jersey, New York, Oregon, Pennsylvania, Virginia, Washington, and the District of Columbia. Point CEO Eddie Lim told Venture Beat the latest round of funding will help the company expand to 30 states by 2020 and help them begin building a 30-year term option.